The modern workplace is demanding. Between relentless meetings, emails, text messages, questions to answer, problems to solve, fires to put out – it can begin to feel like you are drowning in an immeasurably vast sea of responsibilities. Once you check something off your to-do list, 5 items appear in its place. One moment you’re ending a phone call. The next second, a ringtone bleats mercilessly through your brief minute of silence, requiring you to hop right back on the phone. Let’s face it: sometimes it seems this exasperating litany of interruptions is preventing you from getting any “real work” done. But there’s hope! One of the most powerful and enduring lessons I have learned in my over thirty five years of leadership is that these thousands of little interruptions aren’t necessarilykeeping you from the work, they are the work. I’ve talked and written about this at length in interviews and blogs. The notion of re-imagining these moments in an empowering way is one I feel compelled to reiterate. Why? Because by adopting this approach to “interruptions” we can dramatically increase our opportunities to lead effectively, clarify strategy, build trust, and forge meaningful relationships in each moment. In short, we can be more helpful and get more done. All we have to do is remember that each interaction, or “TouchPoint”, is spring-loaded with profound possibilities. So, how do we make each moment count? Practically and tactically – what do we do? Listen Intently: Effective listening is oft hailed as the holy grail of exemplary leadership. But few people get it right. That’s because it takes meaningful practice and focus to connect with others, detect nuances, figure out whose issue it is, and determine what kind of help people need to do their best. When you master being truly present in an interaction, you can become an “aerobic listener.”This means that even though you aren’t speaking, you are fully engaged, inhabiting the moment and paying attention to the other party with laser focus. Remember, giving the other person the space to be heard does not mean being complacent or docile. Dig deep. Be radically curious. Get to the bottom of it! They came to you for help after all. Ask for the evidence and take the time you need to fully grasp the issue. When you feel confident that you’ve wrapped your head around what’s going on, take a moment to briefly summarize to ensure you have it right. Frame The Issue: Once you have extracted the essence of the issue, you’re ready to frame it in a way that will provide clarity. When you frame things superbly, people will be able to pass the information along in a way that is clear and compelling. This requires some finesse. You need to be your most agile and adaptable self. First, determine whether the other party needs greater clarity, confidence, or commitment and adjust your approach accordingly. If it’s clarity they need – you may have to roll up your sleeves and dig into some data with them, or you might have to provide some context to explain the competitive landscape. The key is to provide whatever is missing for them to wholly grasp next steps.If it’s confidence or commitment that is required – connect their purpose and passion to the project. Show them how their strengths make them uniquely suited to handle it. Anchor the issue in whatever drives them. Whatever the situation, frame the issue candidly and speak from your heart. Let people know why their contribution matters. 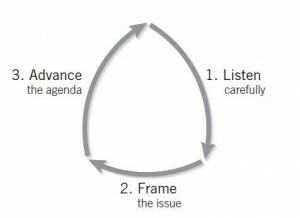 Advance the Agenda: In the third and final part of the triad you must show a bias for action. People came to you to make tangible progress. Help them do it! You listened. You framed the issue. Now you know what is needed to push the problem or issue forward. Maybe you need to help them make a decision.Maybe you need to take the reins and make a call. If you need to connect the people involved with a crucial third party – do it. Make a phone call, send an email, write a memo. Get things moving in whichever way is necessary. This is your chance to provide people with the tools and/or insights necessary to help people meet and exceed their goals. As a leader, advancing the agenda is deeply fulfilling because it allows you to contribute meaningfully to the people in your organization. As you work your way through the triad, some people will be tentative or fearful of making the wrong call. Dissolve their apprehension. Gently remind them of the risk in not acting and reassure them that nobody makes the perfect call every time. At the end of the day, all any of us can do is consider the information available to us at the moment, make the best decision we can, and resolve to do a little bit better each time. This triad provides a framework for you to build relationships and make and support decisions. In every moment. And, the more you do it, the better and more efficient you will become. I encourage you to try the TouchPoint Triad in the next “interruption” you encounter – you may find you are one step closer to being your most exquisitely constructive self.